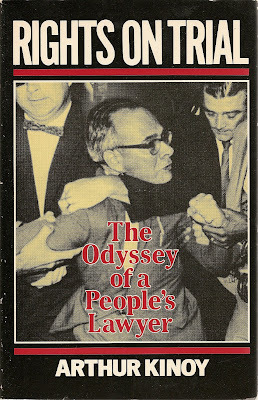 Civil rights lawyer Arthur Kinoy and his partner were working late one evening in June of 1953 when they received a phone call from the distraught chief counsel for Julius and Ethel Rosenberg. The Rosenbergs had been found guilty of treason (for acting as spies for the Soviet Union) and had been sentenced to death. A stay-of-execution had been granted and the Rosenbergs’ team of lawyers breathed a sigh of relief for the summer they now believed they could use to mount a new defense. The Supreme Court (the only body that could overturn the stay) had adjourned for the season. But such was the climate of fear of communism at that time that the Supreme Court justices were called back from their holidays for the sole purpose of overturning the stay. The Rosenbergs were to be executed the next day. At their wits end the Rosenbergs’ lawyers turned to Arthur Kinoy. There was only one thing to do and that was to get a new stay. But most courts were adjourned for the summer. Nonetheless, Kinoy found a judge willing to meet with him: the highly respected conservative Chief Judge Thomas Swan. It was a long-shot. They expected to fail. But they had to try. Judge Swan listened to their case and agreed that a stay was in order. But they needed one other judge to agree in order for the new stay to be granted. Judge Swan sent them to see Jerome Frank, the leading liberal judge on that court, the architect of the New Deal and much progressive legislation. Judge Frank had been an idol to Kinoy and his peers when they were law students. They felt they couldn’t fail. Kinoy repeated the appeal he had just successfully delivered to Judge Swan. And, having made their case to the best of their ability, Judge Frank said: “If I were as young as you are, I would be sitting where you are now, and saying and arguing what you are arguing. You are right to do so. But when you are as old as I am, you will understand why I … why I cannot do what you ask. I cannot do it.” That evening, at 8:00 p.m. Eastern Standard Time Julius and Ethel Rosenberg were electrocuted. “Jerome Frank might, in a profound sense, have changed the course of American history that afternoon. He could not do it. He was a prisoner of the system he served. As a liberal, as a progressive, he had risen to a position of leadership in society. He would jeopardize the usefulness of those labels and, accordingly, the position they afforded him if he participated in the act of courage that Judge Swan, the conservative, was prepared to take. The labels themselves, Frank’s “liberal” past, imprisoned him – kept him from the course he would have taken if he were “as young as” we were. When we were “as old as” he was, he was telling us, we would understand that to preserve our position in society, we must compromise with those in control. I wrote this piece many years ago now. And it was long before that (in 1984) that I learned about Arthur Kinoy. Living at that time in Northampton, Massachusetts, I went to a book launch and was both introduced to American civil rights law and utterly captivated by the passionate Kinoy whose book I had soon read cover to cover. And a stunning read it was with his accounts of the Rosenbergs and an enigmatic brush with the Watergate conspiracy (and about which he drops a rather shattering implication of corruption that I believe remains uninvestigated and is perhaps uninvestigatable). But it was his account of his encounter with Judges Swan and Frank that was seared onto my soul. I have carried this story with me for over 30 years now and it remains a “parable” that challenges me daily. I have long wondered if, given the choice between reputation and principle, which I would find myself choosing. And while I have chosen to live a life of principle over reputation, I cannot make any claims. I believe we all face such tests as Jerome Frank did – perhaps several times in a life, perhaps many. But not all these choices are as grand and consequential as what Frank failed at. In fact, such consequential choices are perhaps the less complicated to engage. What of all the many moments in our work and family lives when our principles come up against the limitations of our egos, our desires and fears regarding our physical needs and comforts, our reputation in our communities? How do we choose? Do we even notice when we make such choices? Perhaps the more subtle (but nonetheless crucial) challenge is precisely to learn to see when those choices are before us. For it is the witnessing of ourselves making those choices wherein lies the hope of our learning always to make better choices. And Kinoy’s experience helps me to see.